Tonilia is a Redguard pawnbroker, fence, and lookout for Delvin Mallory. As you progress in the guild, you will be able to gain access to three more fences by handling a moonsugar delivery for her. 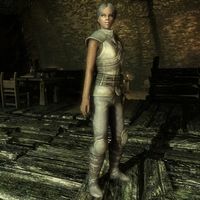 Although she isn't officially a member of the guild, she also handles the supply and upgrading of Thieves Guild armor. She is in a relationship with Vekel the Man, but she refuses to marry him, perhaps because of a rumored affair with Brynjolf. Tonilia will always be found in the Ragged Flagon near her lover Vekel and her friend Dirge. She will always offer her services while pacing the tavern or sitting at a table. While not a member, she still wears the standard Thieves Guild armor and boots as well as a leveled necklace. She also carries a belted tunic, a leveled poison, and up to 54 gold coins. She is armed with two leveled daggers (up to elven quality). Tonilia is held in high esteem by the guild. Vipir will tell you: "I'll point you to the first and last person you're ever going to need to talk to. Tonilia. She's the Guild's fence. Treat her right and she'll make you rich. Try and rip her off and you'll have the whole Guild to answer to." Delvin and Vex will also point you her way: "If you're lookin' to get some coin for the fruits of your labor, you should talk to Tonilia. She sounds tough, but she'll cut you a fair deal." and "If you're ever in need of some quick coin for items you find on the job, Tonilia is the best fence around." "If you're looking for conversation, The Flagon isn't the place." "You don't impress me. So don't even try." "Welcome to the cozy little family. I'm one of the lookouts for the Guild. I watch Delvin's back." "If you're looking for extra work, talk to Vex or Delvin. They'll fix you up." "Stick to the rules and you'll end up rich. Break them and you're out on your arse. Simple, right?" When you approach her to retrieve your guild armor, she will smirk: "So, you're the new recruit, eh? Well, looks like you and I are going to have to get very well acquainted. I'm the fence down here. You come by anything you don't exactly own and I'll pay you some coin for it. Minus a little slice for the Guild, of course. I can also provide a few supplies useful to our trade now and again, for a small fee." If you try to be cocky and ask if there's something she doesn't charge for, she'll put you back in your place: "Sure, how about I get Dirge to knock you over your head and dump you into the cistern? Look, I've been in this business a long time and I've seen all types. You can play it tough, you can play it smart... whatever. At the end of the day you'll find all we care about down here is how much gold you can make us. Good. Then there isn't much more to say. Here's your armor, just make sure you put it to good use." If you inquire about other guild services, she'll explain: "Well, you could always speak to Delvin or Vex if you're looking for extra work. Or if you're looking for training, we've got plenty of it down here. Delvin, Vex, Niruin and Vipir can give you a leg up on that." When you come by to upgrade a piece of your armor, she'll comment: "Well, looks like you're fitting in well down here. I'm supposed to allow you to trade in one of your pieces of Guild armor, so what will it be?" If you ask her if there's anything different about them she'll sigh: "Of course... otherwise it wouldn't be much of a reward, now would it? Your new piece will enhance your skill beyond that of the original. Trust me." If you don't have any armor pieces she'll dismiss you: "Tough luck for you then. Come back when you have at least one of the pieces." Once you've cleared Karliah's name, she will first remark: "There's no doubt Mercer will make for the borders of Skyrim. I hope you find him before he escapes our grasp." Subsequently, she'll thank you: "I heard what happened and the Guild owes you thanks for bringing this to light." When you end your conversation she will seethe: "If you find Mercer, give no quarter... kill him and be done with it." Should you ever be kicked out of the guild, she'll refuse to do business with you: "Sorry, I'm not buying any goods until you straighten this out with Vex." When you've become Guild Master, she'll cheerfully greet you: "Here's to a long and prosperous future... may the Guild last another hundred years." If you ask her for your reward she'll happily hand over a full set of Guild Master's armor: "Yes, and I'm more than happy to give it to you. I mean look at this place. I've never seen so much wealth down here. You've made us all rich. Here you go... should fit you like a glove... boss." After you've completed three special job quests, Tonilia will offer you a side job: "Before we get down to business, I've got something I need you to do. Well, as you know, the Guild's growing and things are looking up around here. The only thing we're lacking is a reliable way to transport our merchandise across Skyrim. I'm not sure if you've noticed, but there are several Khajiit Caravans that travel across the realm. They're shrewd traders and don't mind getting their hands dirty. I've bartered with their leader, Ri'saad, on more than one occasion. Actually, I want you to bring him something. You see, the caravans are notorious for transporting illegal substances. Present Ri'saad with this satchel of Moon Sugar, and I bet my last septim he'll make a deal." She'll also warn you: "You'll find Ri'saad with his caravan group. Just don't do anything stupid when you get there." If you inquire further about the caravans, she'll explain: "Ri'saad is the head of a small syndicate of independent merchant families. Each caravan is obliged to pay dues, but in return a small portion of the profits are shared between them and the leader parcels out the routes. If we could make contact with them, they could provide an excellent way to inconspicuously transport goods for us." If you ask her what Moon Sugar is, she'll happily divulge: "It's an illegal substance highly favored by the Khajiit. Very difficult to come by. If Moon Sugar is refined properly, it can be used to make skooma, another substance that will knock you over after a single draught." Once you've struck the deal, she'll be pleased and reward you with a leveled amount of gold: "Good, I'll contact some of my people and have them prepare some shipments right away. Good job. Here, let me give you something for all the leg work." Delvin: I don't know where you find your sources, but that last shipment of skooma was some of the best quality I've seen in years. Tonilia: I just got lucky is all. Bumped into someone who knew someone else. The rest just writes itself. Delvin: If you like I'd be happy to take it over the operation for you. Take the source off your hands. Tonilia: And lose out just when the going is getting good? No thanks. Vekel: Why can't you just settle down and run the Flagon with me? Tonilia: I don't want to settle. I like things the way they are. Vekel: Come on, Ton. Marry me. Let me take care of you. Tonilia: I can take care of myself. Vekel: Look, I need to know. What's going on between you and Brynjolf? Tonilia: How dare you! After all we've been through together? How can you do this to me! Vekel: Hey, hey. Sorry. I just get jealous when I hear rumors about you. Tonilia: That's all they are... rumors. So quit worrying. Delvin: Tonilia, can I offer some friendly advice? Tonilia: You can offer, but I may not buy. Delvin: Why don't you just formally join up? Quit sittin' here wheelin' and dealin' when you could be out there makin' a heck of a lot more coin. We could use someone with your skills. Tonilia: Thanks for the compliment, Delvin. I may just take you up on that one day. This is the merchandise found in Tonilia's Merchant Chest. These items are only available if purchased from the merchant; they cannot be pickpocketed or stolen. They are restocked every two days. When the quest Under New Management becomes available, Tonilia, unlike the others, will remain at the Ragged Flagon, but won't provide her service. Instead, she'll mention that you should go talk to Brynjolf. As long as you are eligible for upgraded Guild armor, Tonilia will not offer any other dialogue. See Scoundrel's Folly for details and fixes. This page was last modified on 11 June 2017, at 23:52.